As soon as these Ombre Jelly Rolls by Moda came in to the store I knew I had to make something right away. Below is what I came up with. Fabric needed: One Ombre Jelly Rolls and One Bella Solids Layer Cake. The layer cake I used actually had four very light colours in it which I thought worked well with the ombre fabric. 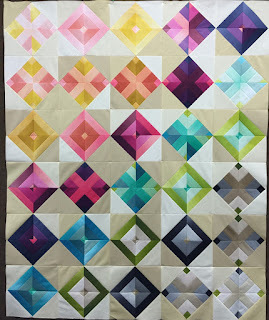 This is a shot of all the jelly roll pieces layed out. There are two strips each of twenty colours, for a total of 40 strips. How beautiful is this!! I placed the strips in groupings of five. I used the strips in the exact order they were in the jelly roll. I figure I'm not going to improve on the designer's layout (Vanessa Christenson of V. and Co.) Remember when piecing several strips together to reverse your sewing pattern on each new seam. In other words, sew from top to bottom on the first seam and then the next, flip the set over and sew bottom to top. This avoids the creation of a dip in the middle of the set. So this is what you will end up. Eight sets altogether. At this point I am drooling over this fabric and colour. The next step is to sub-cut your strip sets into ten inch pieces. I did have to square up the ends at east once per set to get a nice square cut. At the end of each set you will have about 3 inches left. I cut a 2-1/2" strip from these to use for another project. Your sub-cut pieces will now measure 10" by 10-1/2". You need to trim off the excess off the 10-1/2" sides. This picture shows that I trimmed equal amounts off of each side. Now you should have 32 ten inch squares. Even the scraps and gorgeous!! Here is my layer cake. I layered one 10 inch square on top of one of my ombre squares with right sides facing. The solids didn't have a right or wrong side but in case you are using other fabric you will want to make sure both right sides are facing. I pinned all sides of the ten inch sets. Next I sewed around all four sides with 1/4" seam. 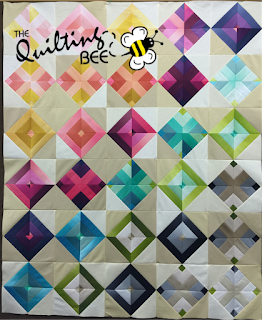 I saw this technique on a Minnesota Star Quilt Co. video. I love all their videos. The next step is to cut from corner to corner, turn and cut across the remaining two corners. I used my Olfa Spinning Mat quite a bit for this project. I love my spinning mat! and here is what you get when you open up the four pieces. Beautiful half square triangles. I pressed toward the light (I know a rule breaker) but you can do whichever way you like. I knew I did not want to press my seams open here because I am going to custom quilt this and I want to have the ditch created by pressing all to one side. As you can see in this picture, you end up with two different designs in the HST's. You can pretty much design whatever you want with these. So many designs out there for HST's. I did a Pinterest Search and there was tons. After playing around, I decided on this type of layout. To get the colour effect I wanted, I did not mix up the colours. As the blocks were coming together, I was in awe of the colour. With my blocks completed, I started playing with layouts. This was my first maybe, but it didn't make the cut. This was my semi-final layout. As my husband pointed out, my two blocks types did not alternate. I explained to him that I was not looking at the blocks designs, but rather the colour, just the colour. Really breaking rules in this quilt ... oh my! I hope you found this tutorial easy to follow. 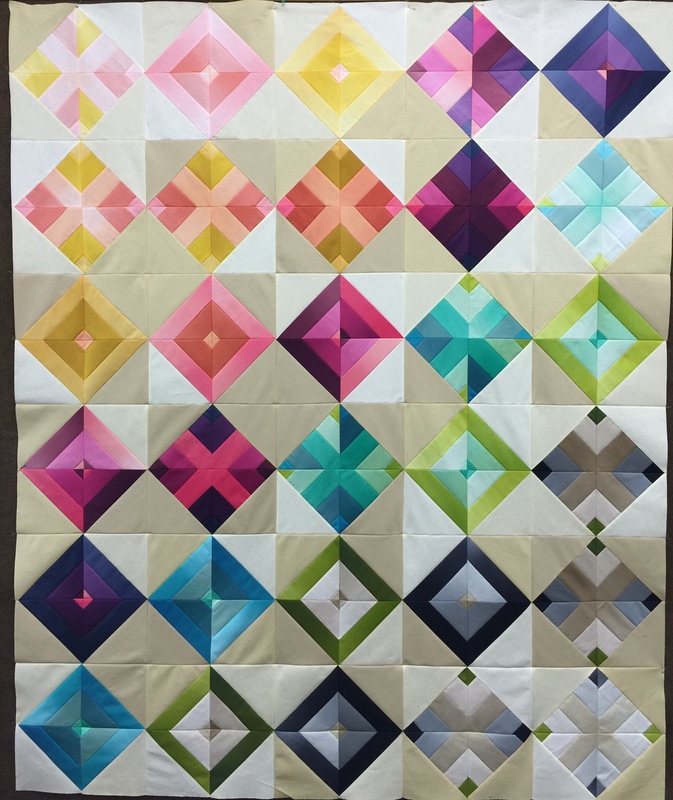 You can use this way of using jelly rolls and layer cakes for any fabric and design your own with your half square triangles.